You can also perform a more selective search for churches in the Belleau area or see them printed on a map. The Anglican parish church was dedicated to Saint John the Baptist. The church is a sturdy stone building. It was rebuilt in the reign of Edward II. The church was restored and almost totally rebuilt in 1862. The ecclesiastical parish included Aby, Greenfield and Claythorpe. The church seats about 250. 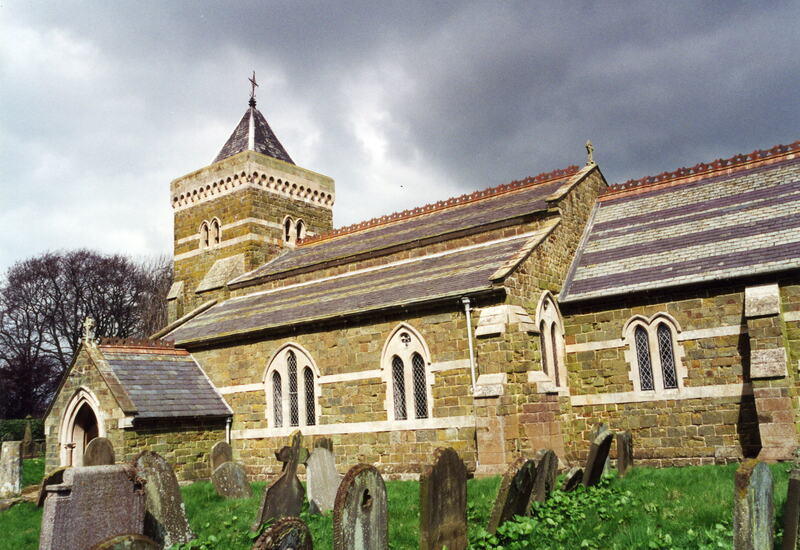 There is a photograph of St. John's Church on the Wendy PARKINSON Church Photos web site. Richard CROFT has a photograph of St. John the Baptist's Church on Geo-graph, taken in January, 2006. The Anglican parish register dates from 1640 and includes Aby and Claythorpe entries. The Family History Library in Salt Lake City has the Bishop's Transcripts for 1561 thru 1833. This small village and parish is in the vale of the Eau rivulet, to which it contributes a small stream. It lies 4 miles north-west of Alford, nine miles north of Spilsby and eight miles south-east of Louth. The parish only covers about 700 acres. By automobile, Belleau lies east of the A16 trunk road between Louth and Spilsby. Turn east off of the A16 at Swaby and drive about one mile beyond Swaby on the back roads. Ask for a calculation of the distance from Belleau to another place. You can see the administrative areas in which Belleau has been placed at times in the past. Select one to see a link to a map of that particular area. The Great Northern railway had a station at Claythorpe (called "Aby" by the railway). Jon HOLLAND has a photograph of the Railway Tavern on Geo-graph, taken in 2008. The tavern appears to be a post-World War II establishement. Near the church are the remains of a large mansion, formerly the seat of the Lords Willoughby de Eresby. The manor was surrounded by a moat. Fragments of a gate house stood to the north. The HUSSEY family had a manor at Claythorpe. One of them was created a baronet in 1661. John FIRTH has a photograph of the Belleau War Memorial in the church on Geo-graph, taken in 2010. For a photograph of the Belleau War Memorial and the list of names on the monument, see the Roll of Honour site. According to A. D. MILLS' book, "A Dictionary of English Place-Names," Belleau derives from the Old Scandanavian "Elgo+lo" where it means "meadow of a man named Helgi". He says, "The modern form, as if from a French name meaning 'beautiful water', is unhistorical. In the 1086 Domesday Book the name is given as "Elgelo". Locals pronounce the name as "Bellow". One of the "children" of Belleau was Sir Henry VANE, an English politician, statesman, and colonial governor. He served one term as the Governor of the Massachusetts Bay Colony, and supported the creation of Roger WILLIAMS' Rhode Island Colony and Harvard College. You can contact the Parish Council regarding civic or politiacal issues, but they are not staffed to assist you with family history searches. Bastardy cases would be heard in the Alford petty session hearings on alternate Tuesdays. After the 1834 Poor Law Amendment Act, this parish was part of the Louth Poor Law Union. The children of this parish attended the school at Aby.